Clemson scored 27 or more points in an 11th straight game for the first time in school history, surpassing a 10-game stretch with 27 or more points during the 2012 season. Including the 459 yards gained against Duke, Clemson has now produced only the seventh 5,500-yard season in school history; all seven 5,500-yard campaigns have been produced under Dabo Swinney. Clemson has now held opponents to 20 or fewer points in six straight games for the first time since games 6-11 of the 2010 season. Clemson held Duke without a touchdown and has now held opponents without an offensive touchdown in eight consecutive quarters. The last touchdown allowed by Clemson’s defense came in the fourth quarter against Louisville on Nov. 3. WIth five touchdowns against Duke, Clemson how has 66 touchdowns this season, moving past the 2017 Tigers (62) for fifth-most in a season in school history. Clemson has now won six consecutive games by 20 or more points for the first time since the final five games of the 1989 season and the 1990 season opener. The two six-game streaks are tied for the longest in school history. Clemson outrushed Duke, 208-104, and has now outrushed opponents 10 times this season. The Tigers have now outrushed opponents in 21 of their 25 games since 2017 and are 21-0 when outrushing opponents in that time frame. Clemson is now 52-1 when rushing for at least 200 yards under Swinney. Clemson exceeded 200 yards both passing and rushing. Clemson is a perfect 39-0 when both passing and rushing for at least 200 yards under Swinney. Clemson did not allow a sack and has allowed only one sack in the last four games. Quarterback Trevor Lawrence completed 21-38 passes for 251 yards with two passing touchdowns and no interceptions. Lawrence also added a career-long 19-yard rush in the third quarter. On his second touchdown pass of the game, Lawrence broke Kyle Parker’s school record for touchdown passes by a freshman (20). Lawrence already held the school record for touchdown passes by a true freshman. Lawrence is now tied with Woodrow Dantzler (21 in 2001) and Charlie Whitehurst (21 in 2003) for seventh on the school’s leaderboard for touchdown passes in a single season. On a seven-yard reception from Lawrence on the game’s first drive, wide receiver Hunter Renfrow caught a pass in his 39th consecutive game, breaking Artavis Scott’s team record of 38 consecutive games with a reception from 2014-16. Renfrow made his 43rd career start to break Terry Smith’s school record for career starts by a wide receiver (42 from 1990-93). Running back Tavien Feaster recorded his fifth rushing touchdown of the season on a two-yard run in the second quarter. The rushing touchdown was the 14th of his career. Wide receiver Justyn Ross recorded his sixth receiving touchdown of the season in the second quarter on a 19-yard pass from Lawrence. Wide receiver T.J. Chase caught Lawrence’s second touchdown pass of the game, a 10-yard reception in the third quarter. It was Chase’s second touchdown reception of the season and of his career. The touchdown pass to Ross was Lawrence’s 20th touchdown pass of the season. Lawrence’s 2018 campaign marks only the 10th season with 20 or more passing touchdowns in school history. Running back Travis Etienne gained 81 yards on nine carries with two rushing touchdowns. With his second touchdown of the game, Etienne notched his 17th rushing touchdown of the year, tying Clemson’s record for rushing touchdowns in a single season, held jointly by Lester Brown (1978), James Davis (2006) and Wayne Gallman (2016). Etienne’s second touchdown tied him with Fred Cone (31) for seventh on the school’s leaderboard for total touchdowns in a career. The second touchdown was Etienne’s 18th total touchdown of the season, tying him with Travis Zachery (18 in 2000) and DeAndre Hopkins (18 in 2012) for second-most in a season in school history, trailing only C.J. Spiller’s 21-touchdown season in 2009. With the performance, Etienne moved into the Top 10 in rushing yards in a single season in school history. His 1,157 rushing yards this season rank 10th in a year program history. Tackle Mitch Hyatt made his 53rd career start to break kicker Chandler Catanzaro’s school record for career starts. Defensive tackle Christian Wilkins made his 41st career start to break Jim Stuckey’s school record for starts by a defensive tackle, set from 1976-79. (Note: Wilkins has also started at defensive end in his career but is currently listed at tackle). Hyatt and Wilkins both played their 54th career game to tie for fifth-most in program history. 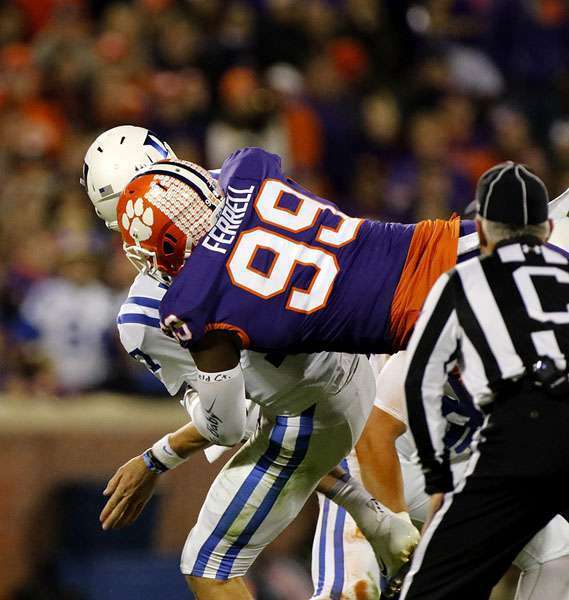 Clemson recorded four sacks as a team, marking the fourth consecutive game Clemson has registered at least four sacks, the team’s first such stretch since 2014 against Louisville, Boston College, Syracuse and Wake Forest. Defensive end Clelin Ferrell recorded 2.0 sacks. Ferrell’s second sack of the game gave him a new career-high 10.5 sacks and made him the first Clemson player with double-digit sacks in a single season since Carlos Watkins (10.5) in 2016. Ferrell recorded at least 2.0 sacks for the third time this season and for the fifth time in his career. Safety Tanner Muse recorded his second sack of the season, the second of his career. Wilkins pushed his career sack total to 14.0 with his fourth sack of the season in the third quarter. On his second PAT attempt, kicker Greg Huegel joined Chandler Catanzaro (207) as the only players in school history to attempt 200 career PATs. Defensive tackle Dexter Lawrence recorded a career-high two passes broken up. Captains for the contest were defensive end Austin Bryant, center Justin Falcinelli, defensive end Clelin Ferrell and kicker Greg Huegel. Clemson hosted Duke for the first time since 2008. In that game, then-interim head coach Dabo Swinney’s Tigers outgained the Blue Devils, 466-168, and earned a 31-7 victory. Clemson held Duke without a first-quarter touchdown on offense. Clemson is the only FBS team in the country to not allow an offensive touchdown in the first quarter this season. Clemson opened a season 11-0 for the fourth time in program history, joining 11-0 starts in 1948, 1981 and 2015. Clemson has now now the first 11 games of a season for the second time under head coach Dabo Swinney (2015). Swinney became the first coach in Clemson history to coach the school to multiple 11-0 starts, as legendary coaches Frank Howard and Danny Ford only accomplished the feat once each, in 1948 and 1981, respectively. The 2018 Tigers won their 11th game of the season to tie the 1948, 1978, 2012 and 2013 squads for the fifth-most wins in a season in school history. Clemson’s active 11-game winning streak is now tied for the fifth-longest winning streak in school history and is the program’s seventh winning streak of 11 games or more all-time. Clemson won its 51st game in the last four years give the 2018 senior class the most wins in school and ACC history, surpassing the mark set by Clemson’s 2017 senior class. The victory was Clemson’s 99th win of the decade. Next week, Clemson will attempt to join Alabama and Ohio State as the only FBS programs to win 100 games this decade. Clemson finished ACC regular season play with a perfect 8-0 record. It represents Clemson’s seventh time winning every ACC regular season game, joining perfect conference records in 1967 (6-0), 1978 (6-0), 1981 (6-0), 1982 (6-0), 1983 (7-0) and 2015 (8-0). The school posted additional unbeaten conference regular season records including ties in 1956 (4-0-1) and 1991 (6-0-1). Including 2015, Clemson joined Florida State (1992-94, 96-97, 99-00, 2013-14) as the only ACC schools to post multiple 8-0 regular season records in conference play since the league adopted the eight-game conference schedule in 1992. Clemson, Florida State (nine times, listed above), North Carolina (2015) and Virginia Tech (2000) are the only ACC schools with perfect eight-game conference regular seasons to their credit. Clemson’s senior class finished regular season conference play 30-2 in the last four years, becoming the first class in league history to win 30 regular season conference games. Clemson’s senior class also improved to 26-1 at Death Valley with one more home game to play next week. Clemson defeated an ACC foe for the 33rd time in its last 35 opportunities, including conference championship games, dating back to 2015. Clemson won its regular season ACC finale for a fourth consecutive season. It marks Clemson’s first four-game winning streak in regular season ACC finales since the 1993-96 seasons. Clemson won its 14th consecutive game at Memorial Stadium, dating back to a 56-7 win against South Carolina on Nov. 25, 2016. The current 14-game streak is Clemson’s second-longest home winning streak in Dabo Swinney’s tenure as head coach (21 from 2013-16). Clemson improved to 6-0 at home this season to give the Tigers at least six home wins in each of the last eight years. Clemson improved to 38-4 in ACC contests at Memorial Stadium under head coach Dabo Swinney. Clemson improved to 37-16-1 all-time against Duke, including a 20-4-1 mark in Death Valley. and improved to 23-3 in night games since 2015. Swinney earned his 112th career victory to pull within one win of Frank Beamer (113) for third-most career wins as head coach of an ACC program. (Note: Beamer’s figure reflects his 113 wins after Virginia Tech joined the ACC as a member institution, excluding his victories as an independent or as a member of other conferences). Swinney remained undefeated against Duke all-time. He is currently undefeated against five ACC programs, including Duke (3-0), Louisville (5-0), Virginia (3-0), Virginia Tech (5-0) and Wake Forest (10-0). The victory improved Swinney to 25-2 all-time against ACC teams from North Carolina, including a 3-0 mark this season. Clemson has won its last 18 games against ACC teams hailing from North Carolina, a streak inclusive of the 2012-18 seasons. 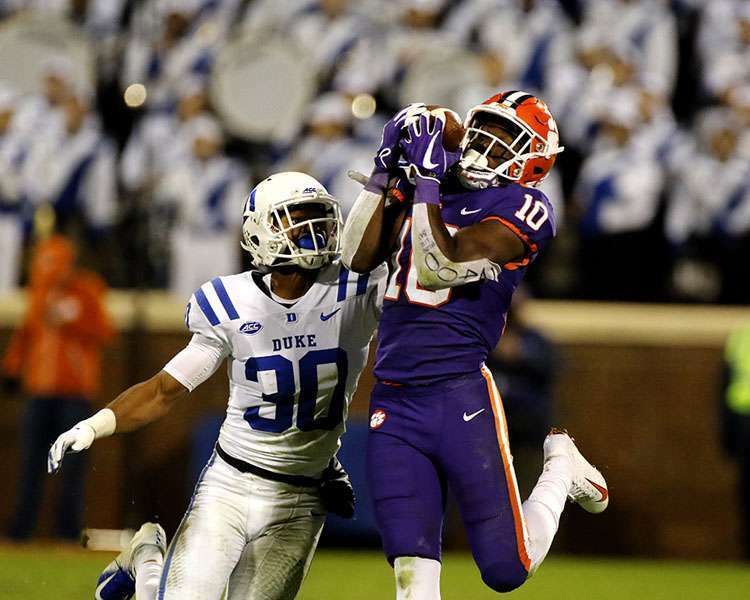 Clemson extended its streak of consecutive home victories against Duke to 15 games, dating back to 1982. The streak ties for Clemson’s second-longest active home winning streak against a single opponent, matching a 15-game home winning streak against Presbyterian and trailing a 21-game home winning streak against Furman. Clemson trailed, 6-0, after the first quarter. The game was Clemson’s first trailing after one quarter this season and represented Clemson’s first win when trailing after the opening period since overcoming a 14-7 first-quarter deficit in a 38-31 win at NC State last season. Clemson took a 14-6 lead into halftime and has now won 62 of its last 64 games when leading at halftime. WIth a 28-6 lead entering the fourth quarter, Clemson improved to 82-2 since 2011 when leading after three quarters.